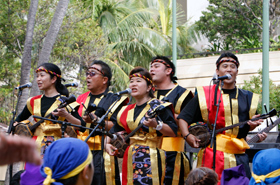 The 17th Annual Honolulu Festival was held for 3-days from Friday, March 11 through Sunday, March 13. 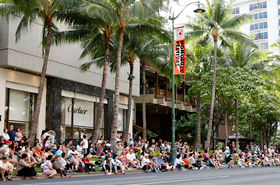 The Grand Parade was held on the final day on Kalakaua Avenue from 4:30p.m. This year’s Nagaoka Fireworks got canceled due to the Great East Japan Earthquake. 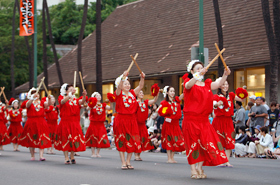 It is known as one of the highlighted events at the Honolulu Festival every year. However, the officials of Nagaoka City couldn’t make a visit to Hawaii. 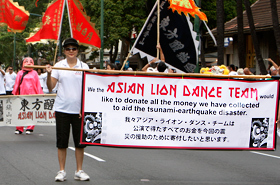 Also, there were many participating groups from Japan that were affected by the disaster, which their shows were also canceled. Hence we altered some parts of the program to adjust the schedule. 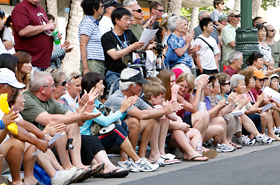 The spectators were already gathered by the roadside from an hour before the opening. They were waiting for the parade in the heat, where the sunlight was still intense even though the sun was starting to set. 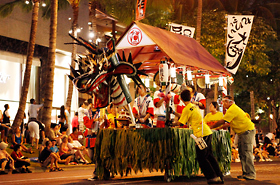 The opening performance was held in the Performance Area, which was set up on the streets of Kalakaua Avenue before the parade. 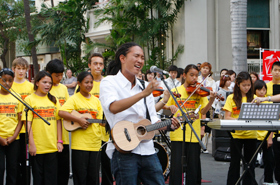 Dai Hirai and the children of Niu Valley Middle School Concert Band performed a theme song for the Honolulu Festival titled ONE LOVE ~Pacific Harmony~ in front of Moana Surfrider, A Westin Resort & Spa where the special guests were present. 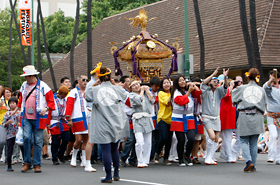 It was followed by the cheerleading team of Inha University from Korea, which they showed vigorous dancing performance. Dai Hirai and the children of Niu Valley Middle School performed together. They are the cheerleading team of Inha University from Korea. 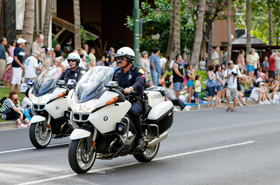 After the opening performance, the parade officially began with a police motorcycle barricade which led the parading routes. 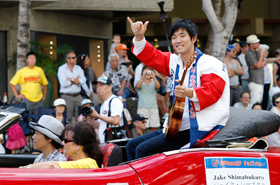 One of the famous ukulele players, Jake Shimabukuro made the first appearance this year. He was in a convertible holding his ukulele in one hand. Also, he offered to do a charity concert to help raise funds for the victims of the Great East Japan Earthquake. He said he thought of ways that he can contribute in which he concluded to hold a concert. 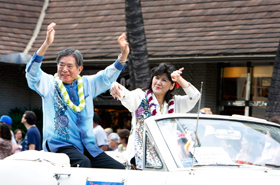 Next appeared was the Mayor of Honolulu, Peter Carlisle. Then followed by the performance of the Okinawan sanshin and drums led by Choichi Terukina, who is a founder of Ryokyu Koten Afuso-ryu Ongaku Kenkyu Choichikai in which he is recognized as a Living National Treasure of Japan. 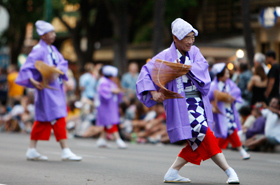 Their Okinawan rhythm brought excitement to the parade. 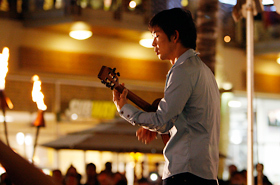 This is the famous ukulele player, Jake Shimabukuro. 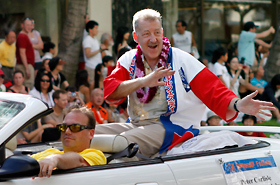 This is the Mayor of Honolulu, Peter Carlisle. Choichi Terukina is a founder of Ryokyu Koten Afuso-ryu Ongaku Kenkyu Choichikai. They are the members of Hawaii United Okinawa Association. There were participating groups from various countries of the Asia-Pacific region such as China, Korea, Taiwan, Vietnam, Philippine, Australia, Samoa, Alaska and Japan. 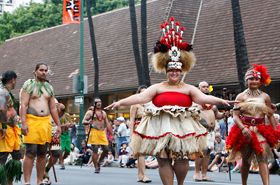 One of the appeals of the Honolulu Festival is that the guest can enjoy variety of cultural dances, music and garments just by watching the parade. In addition, there were many dancing performances such as the hula dance, yosakoi dance, modern dance and cheerleading dance. Also, the cultural performances were performed such as the Japanese traditional art called Nankin Tamasudare. 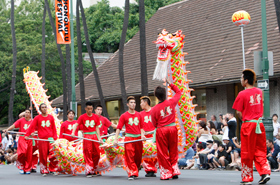 The colorful long dragon runs through Kalakaua Avenue which was performed by the members of the Chinese Chambers of Commerce of Hawaii. They are the members of Inaho Adult Mikoshi. 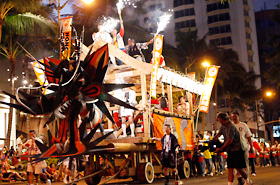 The mikoshi with spirited shouts represent the Japanese festival. There were a lot of cheers and applauses by the spectators on the roadside which was packed with people from the beginning of the streets to the end. The strong visual and bright colored costumes of the members of TAIWAN stood out from the rest. They are the members of Hellgate High School from the state of Montana. 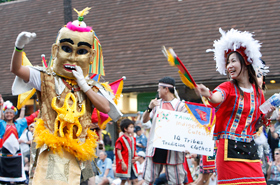 They have participated in numerous parades around the U.S. 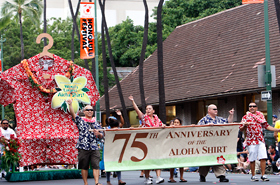 This Hilo Hattie’s giant aloha shirt holds a Guinness World Record. Surprisingly, its size is 400 XL! 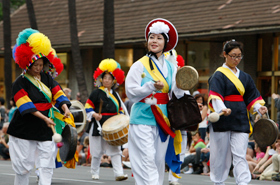 The members of the Korean Traditional Music Association of Hawaii performed a Korean folk music called pungmul. The sound of gongs and drums echoed on the streets. The members of Oedo Tamasudare performed a traditional Japanese art, which they created various shapes of tamasudare. 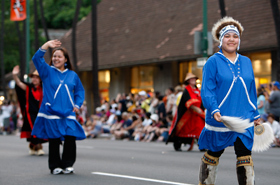 The members of the Alaska Native Heritage Center Dancers continue to protect and preserve their Alaskan culture. The members of Sogaimiti & Malu Organization performed a rhythmical Samoan dance, which made us want to start dancing. The members of the NHK Mito Komaki Kei Hula Halau have brightened up the parade by their red costumes and delightful smiles. 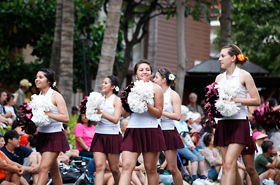 Ysleta High School Cheerleaders from El Paso, Texas holds many cheerleading titles. 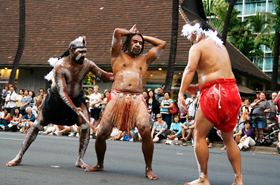 The members of Descendance from Australia performed an Australian Aboriginal dance that depicts a theme of a man coexisting with nature. 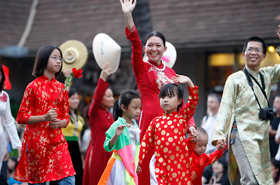 The members of the Vietnamese Student Association of Hawaii paraded in a Vietnamese national costume called the ao dai. 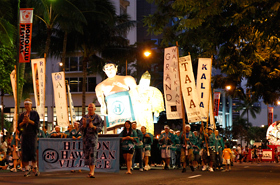 The Hilton’s Sumotori mikoshi owned by Hilton Hawaiian Village moving slowly left to right as it made the appearance. The valiant face painted on the lantern of Hirosaki Neputa appeared in the darkness, which was led by the members of Hirosaki Neputa Manji Kai with their volunteers. The Chibikko (small) Daijayama made a debut, which was created by the local volunteers. 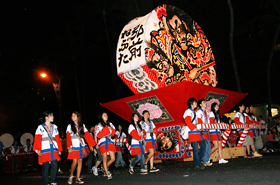 The Honolulu Daijayama made the appearance as the ringing sound of bell echoed in the city of Honolulu. 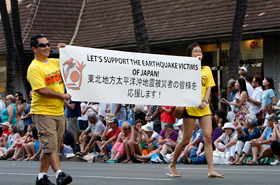 The Great East Japan Earthquake had occurred the day before the 17th Annual Honolulu Festival and Japan was hit by tsunami. The moment of silence was given for those victims before the parade. Everybody including the spectators gave their silent prayers. Also, the fundraising activity was held in between times. Many reached their hands to make a donation. 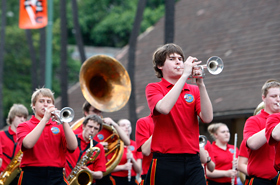 Furthermore, there were groups that raised money on their own during the festival period. 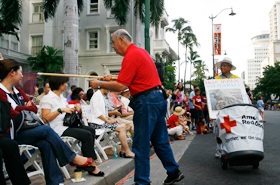 A lot of people gave their warm support to raise the donation at the 17th Annual Honolulu Festival. 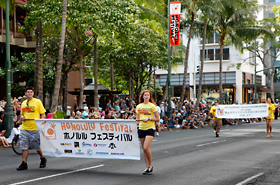 Jake Shimabukuro’s Charity Concert for the Japan-Hawaii Relief Fund was held after the Grand Parade. 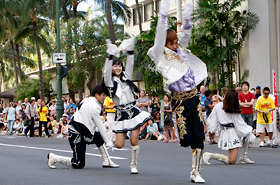 Despite of a sudden event, there were 800 people gathered by the Waikiki Beach Walk where the show took place. Also, Manoa DNA and Dai Hirai agreed to participate in the concert. The concert was only held for about an hour however, it raised $15,000. We would like to express our appreciation for your donation. 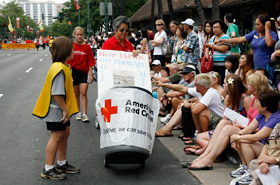 We will continue to raise money for the victims of the Great East Japan Earthquake through our Honolulu Festival’s website. A lot of people came to see the charity concert.